Holy Scripture presents a kind of mirror to the eyes of the mind, so that our inner face may be seen in it. There we learn our own ugliness, there our own beauty. 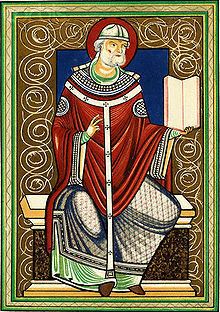 Gregory I (or Gregory the Great; ca. 540 – March 12, 604) was Pope from September 3, 590 until his death. Scriptura sacra mentis oculis quasi quoddam speculum opponitur, ut interna nostra facies in ipsa videatur. Ibi etenim foeda, ibi pulehra nostra cognoscimus. There are some so restless that when they are free from labour they labour all the more, because the more leisure they they have for thought, the worse interior turmoil they have to bear. The bliss of the elect in heaven would not be perfect unless they were able to look across the abyss and enjoy the agonies of their brethren in eternal fire. No one does more harm in the Church than he who has the title or rank of holiness and acts perversely. And let the fear and dread of you be upon all of the animals of the earth.” Clearly, fear and dread were prescribed for the animals, but evidently it was forbidden among humans. By nature a human is superior to a brute animal, but not other humans. Moreover, because the slothful mind is typically brought to its downfall gradually, when we fail to control our speech, we move on to more harsh words. Thus, at first, we are happy to speak of others kindly; afterwards, we begin to pick at the lives of those of whom we speak, and finally our tongues break into open slander against them. Those who do not speak the words of God with humility must be advised that when they apply medicine to the sick, they must first inspect the poison of their own infection, or else by attempting to heal others, they kill themselves. Gregory's letters are extraordinarily interesting, not only as showing his character, but as giving a picture of his age. His tone, except to the emperor and the ladies of the Byzantine court, is that of a head master-sometimes commending, often reproving, never showing the faintest hesitation as to his right to give orders. This page was last edited on 31 March 2019, at 11:33.